Electronic and Chemical cartridges are designed to meet the special needs of the electronics and high purity chemical industries. To minimize extractables, each cartridge module is pulse, power flushed until the rinse effluent reaches 17+ Megohm-cm and less than 3 ppb TOC. Each cartridge module is also individually tested. 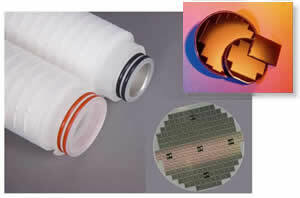 Also offered is a complete range of depth filters and specialty elements to meet your requirements. Please see below.